Saying ‘welcome to May’ didn’t seem too bad, but how is it June already?! I hope you’re all well and business is good. We have seen a big surge in jobs over the past few weeks, and the recruitment industry is a good barometer for how the world of business is doing generally, so it seems that the first 5 months of 2016 have been pretty good. So, there is only really one big topic that June brings with it, the EU referendum. On the 23rd June the results from the polls will decide our fate as a nation within the EU. Have you made your mind up; are you in or out? Have you weighed up what is the right decision for you, your family, your business, education, healthcare and the economy in general? Also, have you had your polling card through the post? Mine has arrived and is in a safe place ready for the 23rd. I’m sure you are all registered to vote, but have you discussed voting with your team or younger members of your family who may now be of voting age? The deadline for registering to vote and have your say in the EU referendum is 7th June, so there isn’t long. The link to register is here. People registering for the first time will need their National Insurance number and, in some cases, their passport. It only takes about 5 minutes to complete the process. If you or someone you know is unsure about the referendum and what it’s all about, or you’re after more information to help you make an informed decision, the BBC website has a lot of great clips to watch. There is also our ‘The ins and outs of the EU referendum’ blog post we recently posted, which should help break things down. In our world, we are seeing some interesting recruitment trends developing. I’ve spoken in the past about being in a ‘jobseeker driven market’. We still are and it’s having some interesting effects on how people are recruiting. Counter offers are still on the rise. This is when an employee hands in their notice to move to a new role and their current employer doesn’t want to lose them, so offers an enhanced package to try and keep them. These are all things to bear in mind and try to factor into your recruitment plans. Forewarned is forearmed, as the saying goes. They also confirm the trend we are seeing in salary increases. Although much of their focus is on ‘temp pay being boosted by the National Living Wage’. A more concerning statistic is their report on staff availability. They have cited the Midlands as having the ‘sharpest decline’ across their four monitored English regions. Accountancy and finance workers are reported as being in shortest supply. And in their ‘Demand for staff by sector’ report, accountancy and finance came top for being most in demand for permanent jobs and second for temporary roles. All in all, I would say that the majority of businesses are doing all the right things to enhance their recruitment strategy. I also think that employees, especially in senior roles, are waiting for the referendum result to influence their future job plans. The next few weeks will be incredibly interesting and will shape our future as a country, as well as the decisions we make for our businesses. Whatever the outcome, at Vanilla, we will be here to support you and your recruitment plans. Whether your focus is on recruiting permanent, temporary or contract employees, we can help you across; sales, marketing, accountancy, finance, general office, legal and HR roles. And once we all know where we stand with the EU, we’ll then be straight into the core holiday season. Remember to get in touch if you need to organise any temporary cover for those summer months. I just wanted to thank everyone who sponsored me to do the MoonWalk in London a couple of weeks ago. I raised £540, which when added with the other ladies I did it with, gave us a combined total of over £5,000 – amazing – thank you all so much. 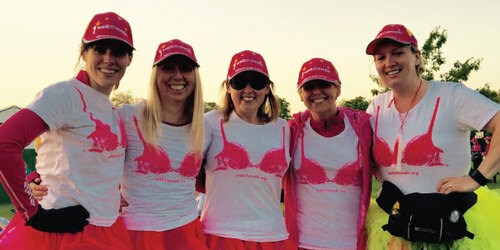 The MoonWalk is a unique event where we got to power walk a marathon (26.2 miles) through London overnight. It was to raise awareness and funds for breastcancer. It was much harder than I thought it was going to be. Missing a night’s sleep and the impact on my legs and hips all took its toll. It was an amazing experience though and I’m so glad I took part.